Norrington and his Stuttgart orchestra give us a slow paced Planets. They do so with conviction, tight delineation and a convincing narrative sense. Try the balefully emphatic Mars and compare this version with the DG disc from fellow early music refugee John Eliot Gardiner. At this pace the lessons learnt by Vaughan Williams writing his Sixth Symphony fifteen years after Holst's death or plain to hear. If you are not irritated by the tempi (and you should not be) you will revel in this freshly envisioned Planets. Speaking of influences, Neptune pre-echoes Bax's epilogic sunset dreams (Sixth Symphony) and RVW's Sinfonia Antartica. 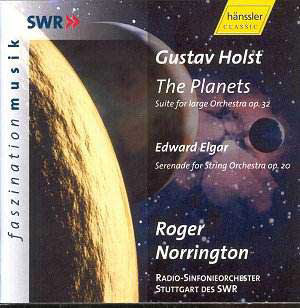 Also I wondered whether Holst had heard Sibelius's En Saga before writing the Planets. This is like hearing this concert-worn work afresh and I recommend it firmly. A concert-worn work casts of its shabby carpet slippers! This has reshaped my attitude to Norrington. I hope to hear in other British 20th century repertoire before too long. And I do hope that he can be encouraged to avoid the most obvious choices. How about Norrington tackling Nystroem�s Sinfonia del Mare, Holmboe�s Sixth Symphony, Rosenberg�s Fourth Symphony? I live in, possibly vain, hope. The weakness of the disc is its not desperately generous timing and the soothing unprepossessing and sickly charm of the Elgar Serenade. Others may be more drawn to the work. My problem with the Serenade is with the work itself not with Norrington's way with it. It is just a pity that Norrington had not struck out into Egdon Heath or surprised us with Constant Lambert's Music for Orchestra - of which, on this showing, the conductor and the SWR orchestra would have made a grand event. Decent multilingual booklet. Recording quality excellent. As far as I could make out there was no audience noise. This is part of Hänssler Classics �Faszination Musik� series.